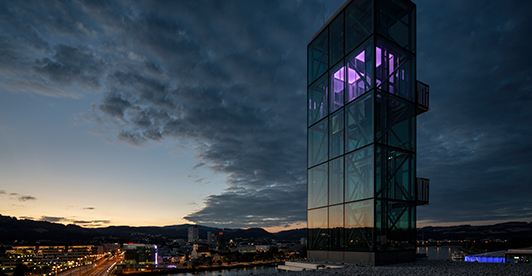 The “transcendental elevator” art project serves as a functional lift and a shining symbol of the university. Meanwhile, it is also a spectacular exhibition space where students can also turn the actual structure into a piece of modern art. 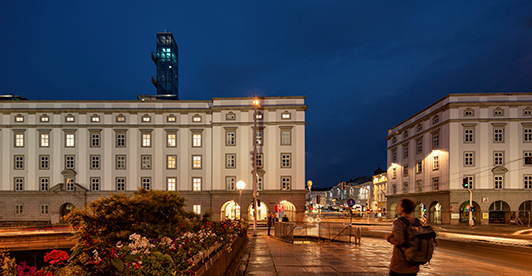 The University of Art in Linz has recently gone through refurbishing. Architects carrying out the renovation have found a way of adding impressive lecture theatres under a glass roof structure on top of its historic building. 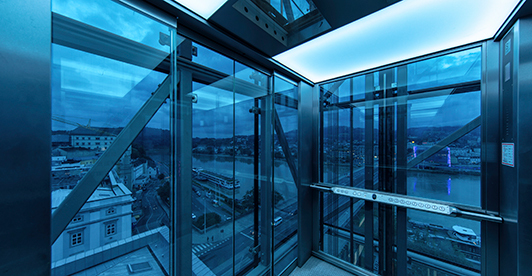 They have used a new lighting design concept to emphasize the imposing stairwells and worked closely with Zumtobel to realize the transcendental elevator project. The Zumtobel team set about developing a vibrant lighting installation. In stark contrast to the small amount of space available, this solution makes a big impression by immersing the elevator in all the colors of the spectrum. As an artistic object, this project required a lighting system that could offer students the greatest possible creative freedom. Yet as a practical goods lift, the specified components also had to be fit for purpose. A frameless illuminated ceiling from Zumtobel managed to hit both of these targets. The intensity and the color of the light can be easily modified using a controls solution that contrasts maximum flexibility with minimal complexity: LITECOM from Zumtobel. As a result, all the necessary parameters can be perfected and programmed according to the specific needs of the students or staff.